(b)	A holder of a relevant bachelor’s degree from a state university or college, or other educational institution duly recognized by the CHED: Provided, That he/she has completed at least one hundred twenty (120) credit units of real estate subjects and training from accredited service providers, as may be determined by the Board; Provided, further, That as soon as a course leading to a Bachelor’s degree in Real Estate Service is implemented by the CHED, the Board shall make this course a requirement for taking the licensure examination. (c)	Is of good moral character, and must not have been convicted of any crime involving moral turpitude. (d)	An applicant for the licensure examination for real estate consultants must show proof that he/she has at least ten (10) years experience as a licensed real estate broker, or an assessor, or as a bank, or institutional appraiser or an employed person performing real property valuation, or at least five (5) years experience as a licensed real estate appraiser. All applications for examination shall be filed with the Board which shall assess and approve said applications and issue to the qualified examinees the corresponding permits or notices of admission to take such examination upon submission of the following documents. Four (4) colored passport size pictures with white background and complete nametag and other documents in accordance with the requirements of this provision. TIP: When you avail of the Comprehensive Real Estate Seminar and Review (CRESAR) sessions offered by accredited real estate review service providers, please check with them if they can help you file your application for the PRC exam. In some cases, they will assist you for a nominal fee. This will help save you TIME. At the moment, we are waiting for accredited review service providers to announce the pricing, venue location, and when they will hold their upcoming CRESARs. As soon as we get that info, we will post it online. We are also waiting for clarifications from the PRC regarding the “at least one hundred twenty (120) credit units of real estate subjects and training from accredited service providers”, because it is not clear if they mean 120 hours. Prior to the passage of the RESA Law, the DTI required 24 credit units, or 24 hours of CRESAR sessions. Before July 2009, those 24 CRESAR hours cost anywhere from P3,500 to P4,500. When po mag start ang PRC mag accept sa mga requirements for real estate board examination this coming May 2015? [From the RESAR Admin] Hi! It’s better to coordinate with your face-to-face review class service provider. Thanks! is there any review center at cebu city for me to review before taking the exam on real estate broker? Hi! May I know what are those accredited review centers for real estate brokers here in cebu? The schedules of classes and the location of the review center. [From the RESAR Admin] Hello… The review service providers we’ve heard of conduct review classes in Makati, Metro Manila. Thanks. Hello! Good Day… I would like to know if there’s an accredited review center some where in Laguna (Calamba)? [From the RESAR Admin] Hi! The one we heard about are offering classes in Makati. Thanks! Hi I’m a graduate of a 2 year course Associate in Computer Technology, and is currently working for 3 years in real estate industry. am I qualified to take a broker’s examination? [From the RESAR Admin] Hello! From what we understand, you need to be a graduate of at least a 4-year college course. To be safe, please inquire at the PRC if they will accept your diploma (2-year course in CT), and if they are willing to issue you an Exam Permit for the REB Exam. Hi, is the Real Estate Broker’s exam held once a year only? [From the RESAR Admin] Hello! The past two REB Exams were conducted by the PRC in March 2011 and March 2012. So far, it looks like a once a year event. Hello. I’m a public school teacher teaching mathematics in high school. Am I qualified to take the Real Estate Broker’s Examination? Do you Have an accredited training center here in Cagayan de Oro? Thank you. God bless. [From RESAR] The PRC will look for a College Diploma, plus proof that you have earned 120 units in real estate subjects (via a 60 hour Comprehensive Real Estate Seminar and Review + 60 hours OJT, or via a 120-hour CRESAR). We will let you know if ever we hear of a CDO-based training center. Thanks! id like to know if ever a board taker wasnt able to take the exam on the given date.. is it considered a failed or not?thanks. [From RESAR] It will probably be considered Forfeited. Hi, I just want to ask regarding the requirements needed for Salesperson. What if the unit that taken in college is only 68.5 units? Am I qualify for the licensed that PRC issue to real estate salesperson? thanks! hello! I’ve been a property consultant for almost a year. and i am a graduate of bachelor of science in mathematics. i would just like to know if i am qualified to take a board exam for real estate brokers? pls give me an advice on how will i be able to take the exam..
[From RESAR] Hi! We haven’t come across such a requirement. Thanks. Hi, will there be no special broker lisency exam for 4th yr. undergrads? I’m sure many 4th yr. undergrads and are presently working as real estate agents are also wanting to be licensed but has no chance to take the lisency exam? We hope that you’ll give them such consideration.. Thank you so much and we are hoping that you’ll be kind enough to give chances to those who have not graduated. [From RESAR] A college diploma is required. We highly encourage you to focus first on graduating. Thanks. the real estate examination that only requires 120 credits will soon be abolished coz CHED will have a bachelors degree for this profession. how soon this will be? any idea? [From RESAR] Our guesstimate is that this will happen when the first batch of BS REM students graduate. Thanks. [From RESAR] Hi! Most likely, the face-to-face review classes will begin in October 2012.
hi admin, i just want to ask how many times prc give exam every year?if there is continues pattern in taking the exam twice a year? i am interested to apply on the late of july- dec. 2012. [From the Admin] Hello! From what we’ve seen, the PRC gives one REBrokers Exam and one REAppraisers Exam each year. The REB Exam will be conducted on March 18, 2012 while the REAppraisers Exam will be held in July 2012. Hi! Would you know of any accredited body conducting real estate appraisers seminar in Baguio? It will help me so much if there is since i am a working mother. [From the Admin] Hello! If ever we hear of real estate appraiser review seminars in Baguio, we will announce it via the RE Appraisers Announcement List. Do you issue certificate of attendance that PRC requires? [From the Admin] Hello! 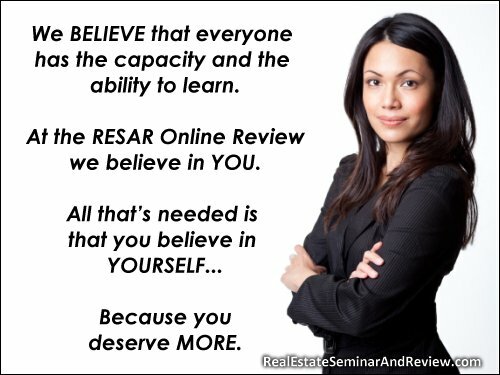 To get the Certificate of Attendance needed when applying for the PRC Examination Permit, you will need to attend a face-to-face Comprehensive Real Estate Seminar and Review or CRESAR review class. Hi hello! i would like to know the next schedule of Broker’s exam? [From the Admin] Hello! We haven’t heard yet when the PRC will conduct the next REB Exam. May I ask if i am qualified to take the Real Estate Brokerage Exams? I am a graduate of BSC-Accounting and Bachelor of Laws…what are the additional requirements, if necessary. I would appreciate much your response…thank you very much..
hi. i wonder if there are any real estate seminar scheduled here in davao so i can earn the 120 units required before i take the exam. please advise as i am interested to become a licensed real estate broker. also if there are schedule of seminars this 2012, kindly inform me also of the corresponding date of exams. [From the Admin] Hello! You need to be a degree holder because one of the requirements when applying for your PRC Examination Permit (REB Exam) is your college diploma. i would like to ask if i am qualified as a license broker since i finished my two years course and 1 year? is it qualified to take the broker’s exam? [From the Admin] Hello! You will need to submit a college diploma when applying for your PRC Exam Permit (REB Exam). Thank you. i am undergraduate of 4 years course commerce one subject not complete. but i already parctice my profession 6 years in real state and complete the 120 units requirements. asking if i can take the board exam. [From the Admin] Hello! You will need to submit your college diploma when you apply for the PRC Examination Permit. Thank you.